These little potato dumplings are a classic in Italian cuisine. You cook them by dropping into a pan of salted, boiling water. Then when they raise to the surface (which means they are ready) you drain them and dress them with any sauce you like. I made a cream and gorgonzola sauce, tossed the gnocchi in it and then blasted them under a hot grill to achieve an au gratin effect. You can buy these ready made in supermarkets (and by the way, English people never know how to pronounce the word right) but they are not a patch on the homemade variety, which are light and fluffy. I used the recipe from the “Cucchiaio d’argento” recipe book. It worked really well. 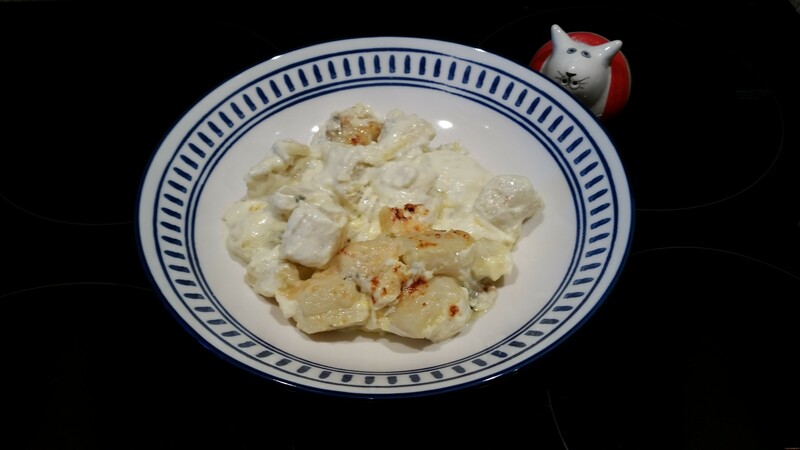 I still remember the first time I made gnocchi many many years ago when I ended up with a mixture that resembled wallpaper paste. It ended up in the bin, of course. But not these little babies which I will make again for sure as they were gorgeous! 1. Set up a steamer over boiling water. Steam the potatoes whole with their skin until tender . It’s important you don’t peel them before steaming them as they will absorb too much water otherwise. While the potatoes are still hot peel them and ideally press them through a potato press in a large bowl. If you don’t have one mash them well . 2. Add the flour, the egg and a pinch salt into the potato mixture. 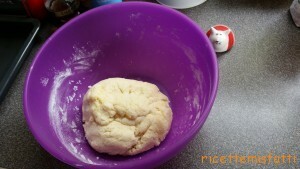 Knead the mixture until a soft, smooth, elastic dough forms. If it seems a bit too soft add a bit more flour. Work carefully and quickly, as the more you handle the dough, the harder and bouncier it will become. Also be careful with the ratio of potato to flour: if there is too much flour, the gnocchi will be hard; if there is too much potato, the gnocchi will tend to fall apart while cooking. 3. Divide the dough into 6 and roll each one into a sausage, each just over 2/3 inch in diameter. Cut each roll into 1/2- to 3/4-inch lengths. Using the floured thumb of 1 hand, press each length to make a dimple in the center, then, if desired, gently roll it against the face of a fine grater to imprint the pattern on the underside. (Alternatively, hold a fork at a 45° angle with the curved side facing you and the tips of the tines touching your work surface. Working with 1 length at a time, roll it down the back side of the tines, pressing gently with your thumb, to make ridges on 1 side. The gnocchi may curl slightly but that’s okay.) 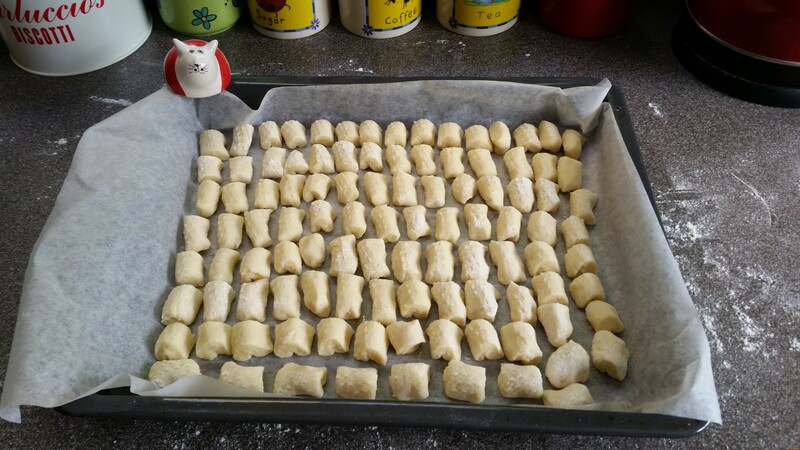 Place the gnocchi in a single layer on a clean dish towel dusted with flour or a baking sheet lined with wax or parchment paper. 4. 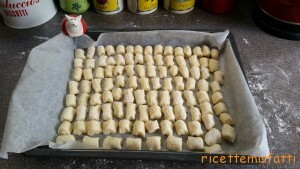 To cook the gnocchi, bring a large pot of slightly salted water to a boil. Add the gnocchi to the water, a few at a time, and cook until they float to the surface. Do not overcook the gnocchi or they’ll fall apart. 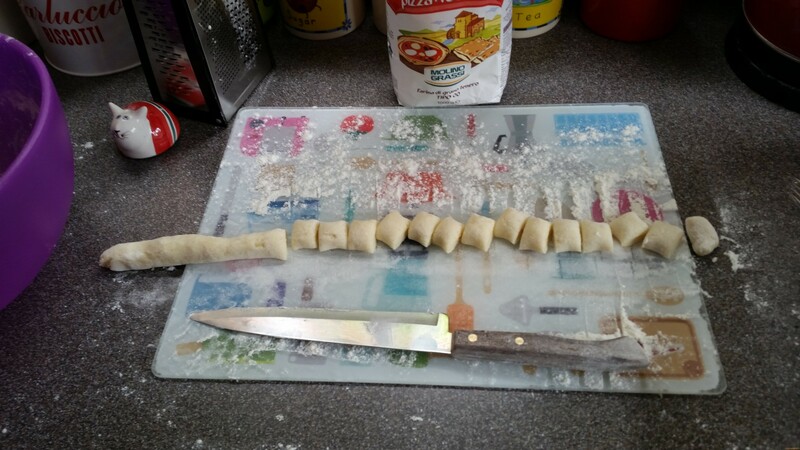 Use a slotted spoon to remove the gnocchi as soon as they rise to the surface, allowing any excess water to fall back into the pot. Transfer the gnocchi to a warm serving dish or platter and add the sauce of your choice. Serve immediately.